If necessity is the mother of invention, then inconvenience must be her sister. 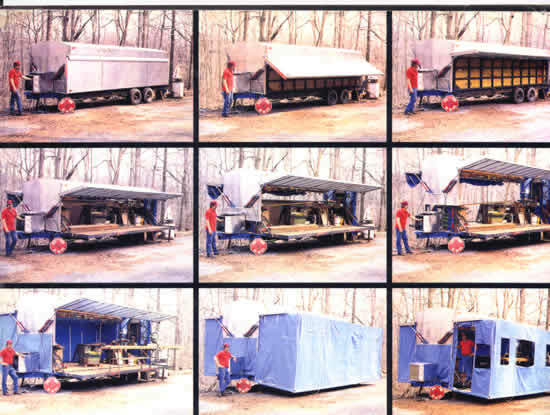 Fed up with having to run back to his shop every time he needed another 10 ft. of molding, Jim Chestnut, a builder in Pound Ridge, N. Y., decided to make his shop portable. Over a two-year period, working nights and on weekends, and at a cost of almost $20,000, Jim put together the technical wonder seen above. constructed of rolled steel square tubing covred with 1/8" Lexan. A hydraulic system intended for farm use opens and expands the trailer. When the weather turns foul, a system of tarps (rigged with sailing hardware) keeps Jim and his partners dry, and electric radiant heat warms the shop. Zip-down windows allow milling of even the largest timbers, right through the winter. Stationary equipment includes a planer, and table saw, a shaper with power feed (each with a 5-hp motor), an 8"jointer, and a 15 in. chopsaw with 18 ft of infeed and outfeed table. A subfloor network of PVC pipe hooks up to an external dust-collection system. Since these photos were taken, Jim had added overhead compressed air, with six outlets and pull-down coil hoses. My first hard bid was reshingleing a gambrel barn in Maine with my lifelong buddy Ken, for his shrewd father, at age 14. My next hard bid came many years later, after running up enough hours on the clock to learn most of Murphy's Laws. From the barn in 1960, till now I have worked concrete, asphault, machinery, timber and stick framing, drywall, electrical, plumbing, trim and cabinet work. Cabinetmaking, and trim have been my specialty since about 1975. 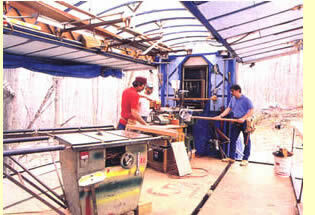 About the time I built the trailer above, I started writing tool reviews and articles for "Fine Homebuilding" magazine. Many of my own tools had undergone radical sawzall surgery to make them usefull, and most of those loaned me for reviews by the manufacturers, went back looking like OSHA nightmares. I also wrote a bit for the "Journal of Light Construction" and did demonstrations for them at their construction shows in Baltimore and Providence: truly a great bunch of professionals, and, like the staff at "Fine Homebuilding", all experienced tradesmen- though most must live with the stigma of a college degree. Between my experience building the trailer and writing tool reviews, I began to see that I really enjoyed tool design, and I really really enjoyed building things that did something when I finished them except just sit there like bumps on a log - which some previous projects actually were, though very thin slices of bumps on a log. Also, I felt that efficient work depended heavily upon proper sequence, a good system and the right techniques.When I, and the friends I work with evolved a good system for trimming, I decided to try improving the tooling required for the job. By the time my patent for the Clam Clamp issued, we had the start of a machine shop. Six years later, we've got a bigger start of a machine shop, and a much better Clam Clamp going out the door. It is ironic that as our eyes get worse, many of us wind up doing closer and closer tolerance work, while standing further and further away from it so we can see it. Having progressed from shingles to framing to trim to cabinets, I went from quarters to 64ths and now to fractions of thousandths. Rest assured, that our equipment here at Chestnut Tool has gigantic digital readouts that can be just as easily read as far away as a foot, or as close as 40 feet. Reprinted from the Back Cover of "Fine Homebuilding" magazine.